Please have a £1.00 parking fee ready when you arrive which will go to the landowner who has kindly given us permission and moved stock for this event. Terrain The courses are run on the N and W facing slopes of Gwanas hill, mostly on open fell, with very brief shelter at the start in the forest. Only one course re-enters the forest. 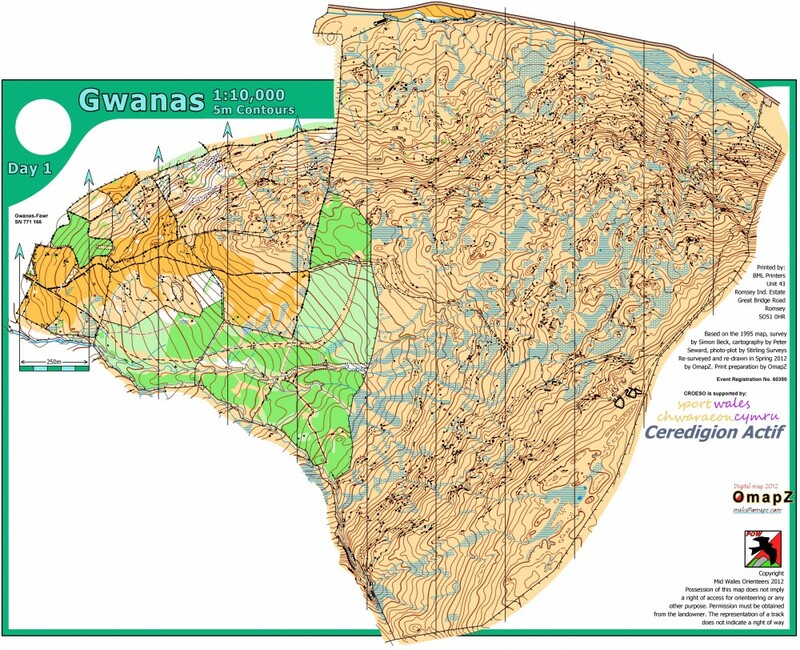 There is considerable climb in the blue and brown courses and there are several water courses and well-mapped marshes, plus some very large crag formations on the fell. The vegetation on the fell is sheepgrazed, offering reasonable runnability. Map & Control Descriptions 1:10,000 with 5m contours. 1995 map by Simon Beck, cartography by Peter Seward, resurveyed ad re-drawn in Spring 2012 by OmapZ. Maps will be A4, printed on waterproof paper. Control descriptions will be printed on the maps and there will be loose ones at the start. Nearest postcode: LL40 2SH for Gwanas Farm on the N side of the A470. Please do not go to this point! Follow the O signs and written directions. Dogs on a lead, please, at all times AND restricted to the parking field only. There will be a ‘cake stall’, proceeds going towards Welsh Junior Squad funds. You are welcome to bring a cake to add to this effort.